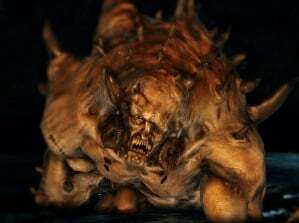 Undead Aberration (Enhanced Undead) is an enemy in Dark Souls 2. Grotesque monstrosities found wading in the dark water in Sinner's Rise, they attack much like the Titanite Demons from Dark Souls; they are slow but can hit extremely hard. They have a massive resistance to magic and fire damage, and also seem to resist lightning. They are not resistant to poison or bleed damage. They are difficult to fight in the water, but can be lured over to the elevator platform where one can hit them with ranged attacks or bait them to fall into the hole. They're believed to be Lord Aldia's attempt on recreating the dragons, these test subjects are either failed attempt or the the first step of mutation, since their bones are formed in the shape of a dragon. Being a member of the Bell Keeper Covenant will make the Shield and Bow drop with very high frequency. Normal Attack: The enemy will swing at the player when in close range, can be up to a 2 swing combo. Tail Attack: Used mostly when the player is not in front of the monster. Double Tail Attack: The Giant will sometimes do a second tail attack. This has a lot of range. Lunging Attack: When the player is in front of him but far away, he'll lunge forward, falling down afterwards. The best attack is to try and backstab afterwards if dodged by rolling diagonally forward. NG: 1,600 Souls,NG+ 3,200 Souls, NG+7: 6,400 Souls.